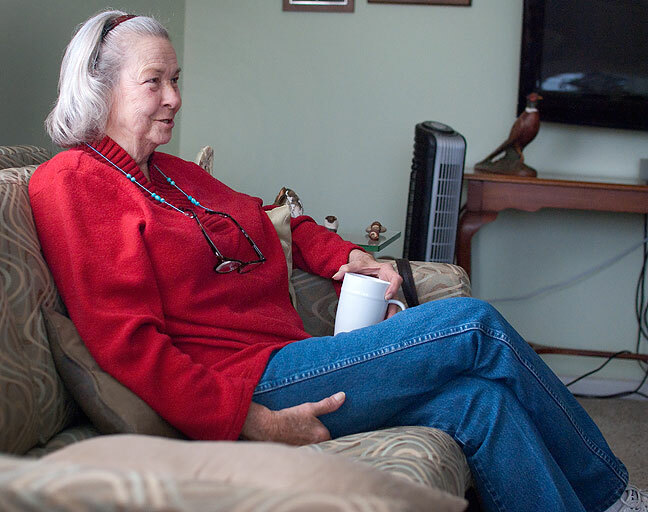 Abby’s aunt Judy sits in our living room chatting with Abby Sunday. Abby’s aunt Judy and her son Donald came to visit us yesterday, with the purpose of visiting, bringing Abby some deer steaks from a buck he recently shot, and giving Abby’s 30-year-old Toyota MR-2 to Donald. 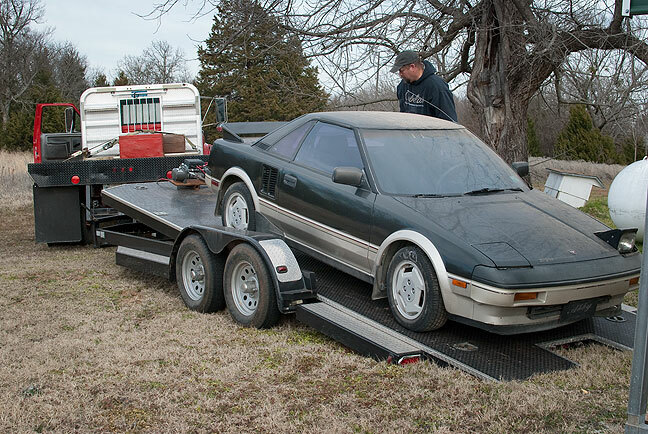 Donald loads up Abby’s 1986 Toyota MR-2. The car is a classic mid-engine roadster, and the first new car Abby ever bought. Toyota only made this model for two years. When I first met Abby in 2002, she drove it most of the time, but as it got older and we got newer cars, it ended up stored. I lack the skills and the parts to fix it up, but Donald is a machinist by trade and can fix pretty much anything, even if it means fashioning parts himself. Abby has loved that car from the day she got it, and it was hard for her to see it go. But she knows it went to a good new home. We also dug through some of Abby’s late father’s things to see if Donald and Judy wanted any of them. Some of these items were quite old and very interesting, like this button holer. It was a pleasure to shoot Donald’s M&P Shield. After putting a few rounds downrange with it, I can see why it is a popular carry gun. After lunch and loading the car onto Donald’s trailer, Abby and Judy sat down for a long visit and Donald and I went down to the pond to send some rounds downrange. He was particularly interested in shooting the Springfield 03A3 that Abby’s dad brought back from the Pacific after the war, which we did, but we also shot some of our other weapons. 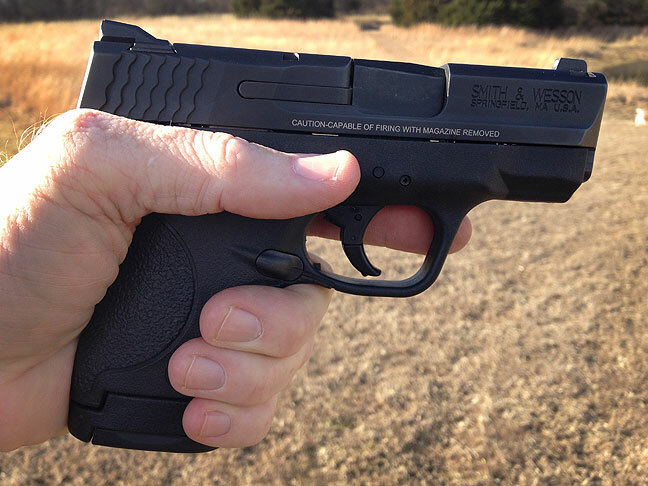 He brought his Smith and Wesson M&P Shield, an excellent compact 9mm pistol, and we shot with it some. The weather was beautiful and the company was excellent. It was a fun Sunday. 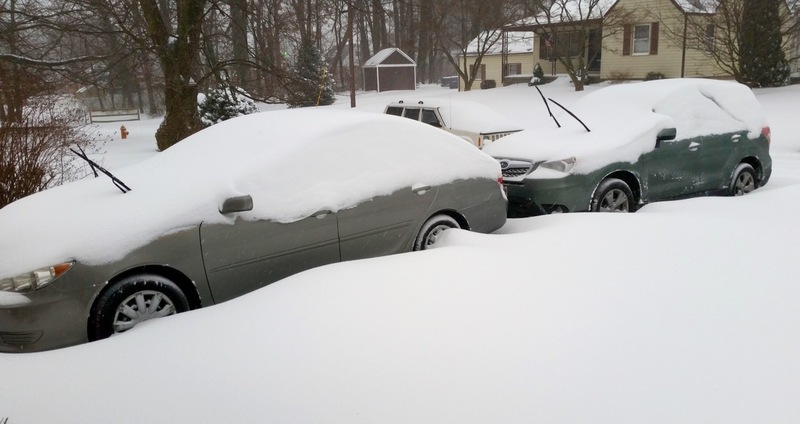 Meanwhile in Baltimore: Tom and Chele sent us this image of the record-breaking snowstorm back east. Wow. Aunt Judy is a fox.